Opposition leader Felix Tshisekedi was sworn in as the president of the Democratic Republic of Congo on Jan. 24, marking the country’s first peaceful transfer of power since independence from Belgium nearly 60 years ago. He immediately announced plans for the release of all political prisoners. The 55-year-old Tshisekedi succeeds Joseph Kabila, a strongman who governed the largely impoverished and corruption-riddled central African country for 18 years before stepping down under intense pressure from civic and political leaders and with the assistance of the nation’s powerful Catholic Church. 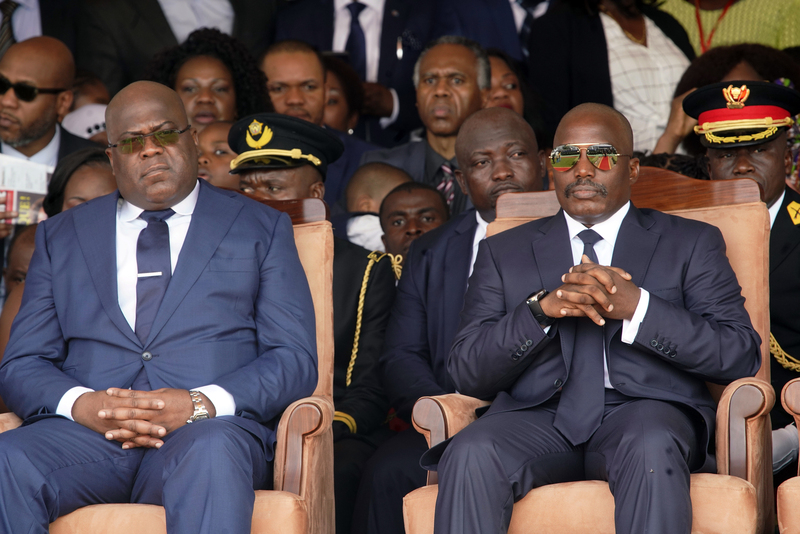 Mr. Kabila watched from behind mirrored sunglasses as the extraordinary scene of an opposition figure becoming president unfolded. When the former president left the dais, some in the crowd booed. Just one other African head of state, Kenya’s President Uhuru Kenyatta, was seen at the inauguration after the African Union and others in the international community expressed reservations about the election. Mr. Tshisekedi called for national reconciliation in the wake of the disputed December 2018 election. The balloting on Dec. 30 was marked by allegations of large-scale fraud and suspicions of a backroom deal orchestrated by Mr. Kabila to install Mr. Tshisekedi over another opposition candidate who, according to leaked electoral data, was the real winner. On Jan. 10 in the capital of Kinshasa, Corneille Nangaa, the head of the Independent National Electoral Commission, announced that Mr. Tshisekedi, leader of the main opposition party, the Union for Democracy and Social Progress, had won with 7 million votes—38.5 percent of the total cast. Martin Fayulu, a Congolese business leader, was recorded second with 6.4 million votes (34.7 percent), and Mr. Kabila’s handpicked candidate, Emmanuel Shadary, followed with 4.4 million votes (23.8 percent). Just one other African head of state, Kenya’s President Uhuru Kenyatta, was seen at the inauguration after the African Union and others in the international community expressed reservations about the election. The United States and others have said they will work with the new leader but have not offered congratulations. Representatives from the National Episcopal Conference of Congo declined to attend the inauguration. “It is an invitation, not a summons. That would be abandoning our convictions,” Fridolin Ambongo, Kinshasa’s archbishop, told France 24 television news. That warning continues the church’s role as national watchdog. “The church has often been an independent voice boldly speaking against government corruption,” Damimola Olawuyi, a researcher with the Lagos-based geopolitical consultancy firm SBM Intelligence, told America. “In a lot of countries where government has failed to provide basic social services, religious organizations have stepped in to provide these services as well as [create] a sense of community and togetherness,” Mr. Olawuyi added. The church had been among the civic forces in Congo that challenged the election results, even as most Congolese appear now ready to accept the outcome as at least a step away from Mr. Kabila’s often brutal rule. Last August, Mr. Kabila, who had been in power since 2001, agreed to step down to allow free elections. After a two-year delay, millions of voters in Congo thronged to polling stations last December to decide who would become their new president. After he was declared the winner, thousands of Mr. Tshisekedi’s supporters took to the streets of the capital Kinshasa in jubilation. But the nation’s influential Catholic Church strongly disapproved of the election results. After analyzing two voting databases, including those from church’s election observers, London’s Financial Times reported that, indeed, there was “huge fraud” and that Mr. Fayulu was the likely actual winner of the presidential contest. “The new figures support the church’s assertion...that the electoral commission published false results,” the newspaper reported. The church’s oversight of the election represents only the latest example of the influential role it has played in national life. About 40 percent of Congo's 80 million people are Catholic, and the church runs many of the nation’s schools and hospitals. Following Congo’s independence in 1960, the church controlled the education system from primary schools to universities. It maintains a vast real estate portfolio in Congo, and its agricultural lands provided employment for the people. From the 1980s, the church became the major civic challenger of Mobutu Sese Seko’s dictatorship, a counterforce to the hardship the regime inflicted on ordinary people. Bishops spoke out against poverty and corruption, inspired pro-democracy movements and in the 1990s financed and nurtured civil society groups for women, youths and human rights. It was the church that provided moral leadership during the years of devastating conflict between 1994 and 2003. Because of its role in promoting democracy, challenging corruption, fighting for human rights and providing basic services to the people, the church gained massive moral authority as well as political and social legitimacy over the ensuing decades. The church was especially instrumental in resolving the nation’s latest political drama, as Mr. Kabila was finally persuaded to relinquish the presidency. He had come to power in 2001 after a bodyguard murdered his father, President Laurent-Desire Kabila. He won two elections in 2006 and 2011 and was due to leave power in 2016. Congo’s constitution only allows two five-year mandates for the president. A court ruling allowing him to stay in power until a successor was nominated, as well as the postponement of elections by the electoral commission, provoked bitter clashes between Congolese people and government security forces. Dozens of anti-Kabila protesters and police officers were killed in the disturbances and many activists were arrested. In early November 2016, Mr. Kabila asked the Catholic Church to step in to help end the crisis. As violence continued, the bishops brokered a deal in December 2016 that called for Mr. Kabila to step down after elections were held before the end of 2017. He was barred from making any changes to the constitution. Can the church in Nigeria stop the violence between herders and farmers? That call was not cost-free. Starting from mid-December 2017, the bells in about 100 parishes rang out every Thursday for 15 minutes as part of a campaign to force Mr. Kabila to honor the church-brokered deal. Parishioners were asked to make all kinds of noise, including banging pots, honking horns and blowing whistles and vuvuzelas. The Lay Coordination Committee, an association of the church, organized three major protests in more than a dozen cities, usually after Sunday Mass, since December 2017. There were some upsides to Mr. Kabila’s 18-year rule. He helped unify a country torn apart by a brutal war, and he supervised reforms that attracted the much-needed investment in mining, communication and infrastructure. But as he steps down this week the nation remains mired in armed conflict in some parts of the country, and poverty remains high. Though Congo is blessed with natural resources like oil, gold, diamonds, timber and coltan (essential in the making of mobile phones and computers), corruption and mismanagement have hindered development for several decades. According to the United Nations, the ongoing conflict in Congo has displaced 4.4 million, the highest dislocated population on the continent. Linus Unah contributes from Nigeria.